Who among us doesn't want to shed some submental fat? That, in case you have shed some of what you learned about human anatomy, is the area under your chin. And a Boston startup, Topokine Therapeutics, is announcing today that it is starting Phase 2 clinical trials of a topical gel that could combat the dreaded double chin. Topokine hopes its gel will be an alternative to cosmetic surgery for some people — if it can win FDA approval. Phase 1 trials are generally conducted to prove a drug is safe, and Phase 2 to show that it does what it is intended to do. But Topokine says that its Phase 1 trial, in which healthy volunteers applied its XAF5 gel to their abdomen, already showed some reduction in fat, as observed by CT scans that compared people using the gel to people using a placebo. In the Phase 2 trial, the gel will be tested under the chin. The company is also working on an ointment that may be able to reduce bags under the eyes. The company announced earlier this year that it had secured funding from Boston-based Schooner Capital, but it didn't divulge the amount. Topokine will likely compete with Kythera Biopharmaceuticals, a publicly-traded California company that is developing a drug for submental fat. But Kythera's drug is delivered via injection. 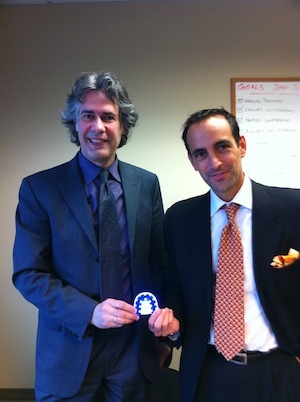 Pictured above are Topokine chief scientific officer Michael Singer and Kalayoglu. (Note the tight chins.) The initial science for Topokine was done at Mass Eye & Ear Infirmary, and both Singer and Kalayoglu have worked there. Before the month is out, I wanted to share a few photos and audio recordings from the annual Convergence Forum, a life sciences industry gathering held on Cape Cod on May 16th and 17th. This was the tenth year for the event, which explores what's happening as the businesses of biotech, big pharma, medical devices, consumer electronics, and healthcare start to collide and collaborate more, and develop interdependent products. Speakers came from MIT, BiogenIdec, Johnson & Johnson, and Bristol-Myers Squibb. Jeff Walsh represented Bluebird Bio, a Cambridge company focused on gene therapy that had filed for an IPO a few days earlier, and Deborah Dunsire, CEO of Millennium Pharmaceuticals, had recently resigned from her job at the Japanese-owned developer of cancer drugs. 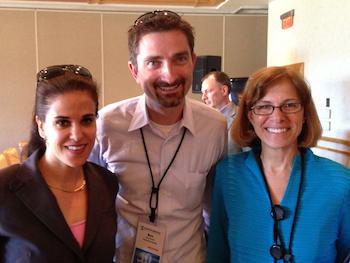 Daphne Zohar of PureTech Ventures, Benjamin Heywood of PatientsLikeMe, and Katherine Bowdish of Sanofi. Radio producer Rachel Gotbaum and David Ewing Duncan, author of "When I'm 164: The New Science of Radical Life Extension." 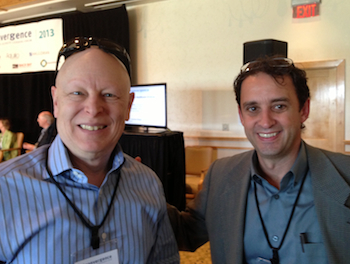 Michael Gilman of BiogenIdec and Arthur Tzianabos of Shire HGT. Audio recordings of several sessions are below. Click "Play," or click the session title for more info. If this had been an ordinary week in Boston, the workers who hustle down the hallways of our city's hospitals would've been doing all the things they ordinarily do: drawing blood, tending to patients, performing heart bypasses, delivering babies, running MRIs. This was nothing like an ordinary week. By Thursday night, after some patients had been released, and others were on the road to recovery, there were new victims on their way to the hospitals: an MIT campus police officer, Sean Collier, who died, and an MBTA transit police officer, who was wounded in a firefight and brought to Mount Auburn Hospital. Then, Beth Israel staffers tried to revive one of the bombing suspects, who showed up in their emergency room at 1:10 a.m. this morning with gunshot and blast injuries. One Beth Israel doctor, David Schoenfeld, happens to live in Watertown. When he started hearing gunshots and sirens in his neighborhood last night, he did the obvious thing: he drove to work. "You give the best care you can to every patient that comes to you, regardless of what may or may not be," he said at a press conference earlier this morning. "Whether it was a suspect, an innocent, a police officer, you have no idea who it is when they arrive. You give them the best care you can." If this had been an ordinary week, doctors, nurses, technicians, and admin staffers would have simply been delivering their best care all around town, without getting much appreciation from those not wearing one of those plastic hospital bracelets. A few of them would have run the marathon on Monday to raise a few million for research initiatives and patient care, gone home, and maybe recuperated a bit. This has been a far from ordinary week, and we owe tremendous gratitude to all those green-gowned workers who show up for work at our city's hospitals on normal days and the rest, ready to help all of us. A once-promising drug delivery startup that sprang from the labs of two high-profile MIT professors has run out of money without actually delivering a product. SpringLeaf Therapeutics raised more than $20 million from local VC firms Flybridge Capital Partners, North Bridge Venture Partners, and Excel Venture Management to develop a new kind of wearable pump system that would infuse drugs into patients subcutaneously, without requiring visits to a clinic or hospital. But the Boston company ceased to exist last month, according to a filing with Delaware's Division of Corporations. SpringLeaf spent most of its lifespan trying to perfect its complex battery-powered delivery system, but never got to the point of conducting a clinical trial. That may not be the end of the SpringLeaf story, however. Pieter Mundendam, right, the former BG Medicine chief executive who was brought on last September to lead SpringLeaf, has acquired some of the company's assets. He has formed a new entity, scPharmaceuticals, to continue work on a wearable pump. Working alongside Muntendam are three other veterans of SpringLeaf, including chief scientific officer Glenn Larsen. scPharma's website says it will focus on using the pump to deliver a diuretic to heart failure patients, helping to control the fluid buildup that often sends the patient back to the hospital; SpringLeaf had focused, at least for a time, on delivering the blood product immunoglobulin to patients with compromised immune systems, according to one former SpringLeaf employee. But the company encountered problems getting prospective partners interested in its technology, and also in reducing the size of the device, according to this ex-employee, who requested anonymity. Muntendam told me this morning that he wasn't ready to share specifics about the funding he is raising for scPharma, but he said it will rely on a different delivery technology that he expects will be less expensive to produce, deliver drugs more precisely, and face "a lower regulatory hurdle" than what SpringLeaf had been working on. (Muntendam did say in a later e-mail that several of SpringLeaf's investors "are considering participating in scPharmaceuticals.") The new delivery technology comes from Switzerland, he says, and scPharma won't be relying on the original intellectual property out of MIT. In the final months of SpringLeaf's existence, he says, "We were changing the path of the company," turning it into a pharmaceutical company that would develop its own formulation of drugs that could be delivered with its device, in an effort to attain higher profit margins. But there wasn't sufficient financial support — or patience — from SpringLeaf's backers. He calls scPharma "a Phoenix company rising out of that," adding that developing a device capable of keeping patients out of the hospital is "a great opportunity." The second class of the Healthbox accelerator program in Kendall Square gets underway this week. Geared to entrepreneurs developing new software, services and devices for the healthcare industry, the local offshoot of the Chicago-based accelerator has Blue Cross Blue Shield of Massachusetts as its major backer. Entrepreneurs who participate cough up seven percent of their company's equity to Healthbox, in return for free office space, mentorship, and $50,000 in seed funding. · 3Derm Systems offers a low-cost skin monitoring solution allowing patients to take two-and three-dimensional images of concerning lesions at home before being digitally reviewed by a dermatologists. · Caring in Place is a platform that allows users to coordinate care of an individual among family and friends while also discovering and utilizing local services. · Casagem provides a tablet-based data collection and data-processing tools for the homecare industry. These tools will allow underutilized homecare nurses and support workers to complete mandatory on-site homecare forms via tablet, thus improving the precision of data collection and optimizing provider involvement. · Cellanyx is developing a biomarker-based diagnostic urine test to determine oncogenic and metastatic potential for prostate tumors. · Epion delivers a cloud-based, device-agnostic tablet solution that transforms the expensive and inefficient paper-based intake and discharge processes to a far less expensive, more accurate mobile digital solution. · Hospitalytics is an analytical software to improve operating room (OR) efficiency by predicting booking trends and enabling OR managers to delegate surgery appointments and staffing accordingly. · LeanWagon provides a wellness coaching program that includes interactive on-line workshops offered to the employees of participating companies. · MyProxy is developing a web-based platform that enables patients to create, update, and share healthcare proxies and advance directives for end-of-life care. · Sensing Strip is a device that integrates thin film sensing electronics with kinesiology tape. This "electronic sensing tape" can be placed anywhere on the patient’s body, where it will sense and wirelessly transmit real-time ambulatory, cardiac, respiratory, or a variety of other data to a smart phone or tablet. · Theravid is a customizable web-application geared towards improving physical therapy adherence in the home. Only three of the teams come from outside of Massachusetts: Casagem (Toronto), Epion (New Jersey), and Caring in Place (Colorado). The teams will present to investors and community members at a demo day in June; the exact date hasn't been set yet. Last time around, the company that attracted the most audience votes for its "creative solution" received an additional $25,000 award. J&J is coming to Kendall. One of the last big pharmaceutical companies without an outpost in the life sciences capital of the world is remedying that oversight, opening an office at One Cambridge Center this spring. Johnson & Johnson's Boston Innovation Center will be run by Robert Urban, right, a onetime biotech entrepreneur who was most recently executive director of the Koch Institute for Integrative Cancer Research at MIT. (That's the top administrative position, reporting to director Tyler Jacks.) Urban started at J&J in early November, and he is already managing a group of more than 20 employees — both new hires, and J&J veterans who are relocating to the area — working in temporary office space in the Back Bay. New Jersey-based J&J, maker of Band-Aids and baby shampoo, is the second-biggest pharma company in the U.S. by revenue, just behind Pfizer. (And Pfizer is building a big new R&D facility in Kendall, slated to be finished later this year.) The Cambridge office will help forge and manage research collaborations with universities and companies working on new medical devices, drugs, diagnostics, and consumer health products, and also make investments in start-ups. Even before the establishment of the Boston Innovation Center, J&J has worked with MIT and local companies like Vertex Pharmaceuticals, Millennium Pharmaceuticals, and Alkermes. "What we really hope to do is try to simplify for the outside world how you might try to interact with J&J," Urban told me this morning. "We have 250 businesses spread across the world. With these innovation centers in Boston, Menlo Park, London, and Shanghai, we're creating four red doors" — red, of course, being J&J's corporate hue — "that innovators can walk through to help them figure out who to work with here." The Boston Innovation Center will be staffed with technical experts in areas like neuroscience, oncology, and vaccines who can evaluate prospective partnerships; a team to craft contracts and then manage those partnerships; and also investors from J&J's corporate venture capital arm. Urban says that the focus of the Boston Innovation Center will be on products that are "pre proof-of-concept, or basically pre-phase 2 randomized clinical trial." Anything at a later stage would typically be handled by corporate development or mergers-and-acquisitions teams within J&J's business units. And with several big J&J drugs having lost their patent protection in 2011 and 2012, it isn't surprising that Urban adds, "We're focused on collaborations that can head to commercialization as soon as possible." Urban says that setting up a J&J research-and-development lab in Cambridge isn't part of the current plan. "It may turn out that as we do some of these projects [with partners], it might make sense for some of our researchers to work side-by-side with the companies, and we're not averse to that," he says. But the company's strategy doesn't involve establishing a "substantial physical research footprint here." Boston's sports franchises aren't exactly giving us the chance to don our foam "We're #1" fingers lately. But the local life sciences industry is once again taking top honors, in a new report from the commercial real estate firm Jones Lang LaSalle. And isn't developing new drugs and treatments that save human lives just a smidge more important than that football game on Sunday? 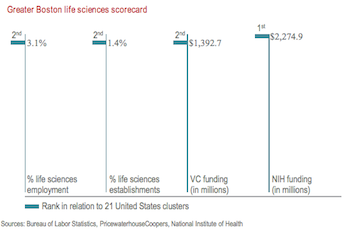 The report ranks the Boston area life sciences scene as the premier R&D cluster in the world, with more than 74,000 life sciences employees; five of the top eight NIH-funded hospitals in the country; and numerous major research universities, including Harvard, MIT and Tufts. Behind Boston in the rankings are San Diego and the San Francisco Bay Area. This is the second year that Jones Lang has issued its report on life sciences clusters, and the second year that Boston has topped the list. In Kendall Square alone right now, says Jones Lang VP Don Domoretsky, there are 2.5 million square feet of new life sciences buildings in the works. Big pharma companies and smaller biotechs "are feeding off the innovation produced by the universities," says Domoretsky. "All these decisions are driven mainly by talent, and access to intellectual capital." The asking price for top-notch space in Kendall right now is $65 per square foot, according to the report. And as companies like Novartis grow in Cambridge, where real estate and salaries aren't exactly cheap, they're seeking to balance that by also expanding in lower-cost places, like Shanghai, Domoretsky says. When Vertex Pharmaceuticals moves from Cambridge to Boston's waterfront Innovation District in 2014 and 2015, that could make Boston a more appealing place for life sciences companies to locate. But Domoretsky points out that there is "not really much lab space in the Innovation District right now." Though there are some biotech startups in the Marine Industrial Park, "there is not a lot of inventory yet," he says. "We're riding a nice wave right now," says Peter Abair, the director of economic development and global affairs at the Massachusetts Biotechnology Council. "We're getting investment from the traditional pharmaceutical side of the industry, and still generating these second-generation biotech companies like Momenta, Ariad, AVEO, and Ironwood, which are expanding here and making big investments in Massachusetts." Below is a map from the report showing some of the current and planned development projects in Kendall. Update: LabCentral now has a website, and on February 7, 2013, the Massachusetts Life Sciences Center announced a $5 million grant to help it get off the ground. The projected opening date is November, 2013. It will be 27,000 square feet, with room for 20-30 entrepreneurs and startup businesses. The founders of the Cambridge Innovation Center and the MassChallenge startup competition, Tim Rowe and John Harthorne, are collaborating to create a new startup space for businesses that need a laboratory to develop new kinds of biopharmaceutical or synthetic biology products. Working with them on the project, called LabCentral, are Peter Parker and Johannes Fruehauf of the consultancy BioInnovation LLC, which already operates a small lab space in Kendall Square, Cambridge Biolabs, as a kind of "beta test" for a larger facility. The partners say they hope to open LabCentral by mid-2013. Rowe points out that the cost of an individual company building out its own lab is "very high," and that many of the existing turn-key spaces around town, like the Venture Development Center at UMass-Boston and Boston University's BioSquare Discovery and Innovation Center, tend to run pretty close to capacity. Cautioning that the project is still "PowerPoint-ware at this point," Rowe tells me the team is focused on creating a 20,000-square foot space in Kendall Square that could accomodate dozens of companies. It'd be dedicated primarily to lab tables, ventilated hoods, and equipment, with a few conference rooms or shared desk areas for meetings and computer-based work, Parker says. (20,000-square feet is about the same footprint as a single floor of the Cambridge Innovation Center's building at One Broadway in Kendall, Rowe says.) Tenants would be able to rent a single "bench space" in the lab for one scientist on a month-to-month basis, Parker says. Fruehauf will be the on-site executive director of the new facility; he is also president of ViThera Pharmaceuticals, a startup developing engineered probiotics to treat inflammatory bowel disease. The space would be operated as a non-profit, Rowe says, and would probably rely on some kind of city or state funding to get off the ground. Given the requirements for pricey lab gear like microscopes and flow cytometers, "it's hard to make the math work on a purely private basis, and keep the rents reasonable," he says. The team may apply for a grant from the taxpayer-funded Massachusetts Life Sciences Center, which was created to support job growth in the life sciences industry, and they're also hoping to get some of the equipment donated by manufacturers. Can a 75-year old health insurer spark some radical innovation on the local startup scene? That's the goal of a new partnership between Blue Cross Blue Shield of Massachusetts and Healthbox, which runs a three-month "accelerator" program for entrepreneurs working on new products and services for the healthcare industry. The new program starts today, with 10 teams taking up residence in Kendall Square — in the same office building where DogPatch Labs and TechStars Boston are based — and wraps up with an "Innovation Day" in November, when they'll show off their progress. Healthbox, founded in Chicago, is the second healthcare-oriented accelerator program to set up shop in the Boston area this year; Rock Health, originally from San Francisco, is about to conclude its first local session, with an investor showcase next Friday. Healthbox offers the companies it accepts free office space, mentorship, and $50,000 in seed funding, in return for a seven percent equity stake. (About 130 startups applied this year, says Healthbox founder Nina Nashif. She's second from the right in the picture.) The entire inaugural group of Healthbox companies hail from Boston or Cambridge, though Nashif says she received applications from entrepreneurs in other cities. "We're looking for things that can help improve the efficiency and affordability of health care," says Allen Maltz, chief financial officer at Blue Cross Blue Shield of Massachusetts. "And of course, another important goal is stimulating innovation and helping to get the economy moving again." Maltz says that numerous Blue Cross employees will serve as mentors to the Healthbox startups. Nashif says that more than 50 people have committed to be mentors so far, and that the list continues to grow. I'm not exactly sure why today's keynote conversation at the BIO International Convention was closed to the "mainstream media." (It was open to biotech industry trade reporters.) Nothing controversial was discussed, no news was made, and there was no time for a question-and-answer session. Mostly, two collegial former U.S. Treasury Secretaries defended their past actions, forecast some continued choppiness for the global economy, and expressed optimism that the U.S. will be able to avoid capsizing, by arriving at some kind of bipartisan compromise (after this year's Presidential election) to increase taxes and cut spending. Little was discussed that had specific relevance to biotech or pharmaceutical companies, which probably explained why the ballroom at the Boston Convention & Expo Center was more than half empty by the time the session wrapped up at 2 p.m.
"From the beginning of time, we've had financial crises," he continued. "The root causes are almost always failed policies at the government level." In the years leading up to the housing crash of 2008, he said, those policies encouraged people to borrow too much and save too little. "We've done very little to correct [those] policies," he said. The BIO party list: Which events are considered must-attends at next week's big biotech trade show? Along with the usual keynotes, panels, and booth-schmoozing, there are a bunch of sponsored shindigs that take place around the city — at venues like the Harpoon Brewery, the MFA, and the Liberty Clipper tall ship, pictured at right. According to a list compiled by Doug MacDougall of the Wellesley PR firm MacDougall Biomedical Communications, there are more than 70 parties and special events happening between Sunday and next Thursday. I surveyed 20 biotech executives to find out which ones were on their "must-attend" lists. Note: All of these (except for the Unofficial BIO Tweetup on Tuesday) require an invitation. 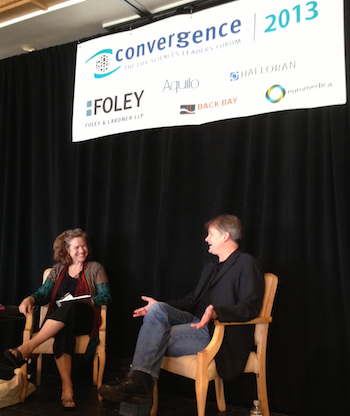 Just sharing some photos and audio from this month's Convergence Forum in Chatham, Mass. It's a conference that brings together executives, entrepreneurs and investors from the New England life sciences business. (I'm on the advisory board.) Some of the big speakers this year included Genzyme CEO David Meeker, Third Rock Ventures founder Mark Levin, OvaScience CEO Michelle Dipp, and Jose-Carlos Gutierrez-Ramos of Pfizer. You can see the Twitter traffic for the event here. 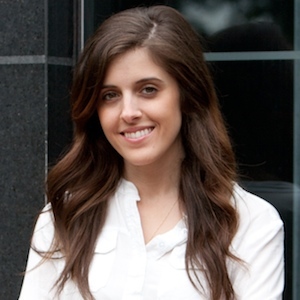 Rock Health founder Halle Tecco tells me that she's planning to launch a Boston edition of the well-regarded incubator program for startup teams using technology to tackle healthcare problems. The program will be held on the campus of Harvard Medical School in Boston, and will accept about six startup teams. Each chosen team gets a grant of $20,000, without having to cough up any equity. This year's program will start in June and conclude in August with a "demo day" for investors. Ed Coburn, director of the health media group at Harvard Med School, helped Tecco expand the program from its San Francisco base to Boston. Already signed on to mentor are local entrepreneurs like Jason Jacobs of RunKeeper, Ben Rubin of Zeo, Erika Pabo of Harvard Med School, Sonny Vu of Misfit Wearables, and Jacob Sattelmair of WellFrame. 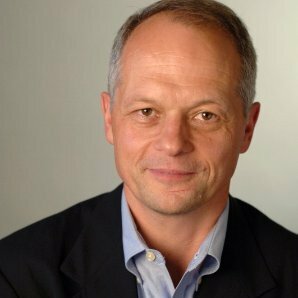 Former MIT Media Lab director Frank Moss, a co-founder of Infinity Pharmaceuticals, has been a mentor for the San Francisco program and will participate in Boston as well. Tecco says the program's goal is to bring "radical innovation" to healthcare. The Harvard Med School relationship — and the Longwood location of the program — will give entrepreneurs who participate an opportunity to test their prototypes in partnership with experienced docs and other medical professionals, she says. Tecco says that Rock Health was the first incubator program exclusively targeting health startups (there are now others, like Blueprint Health and Healthbox.) She launched it after getting her MBA from Harvard Business School, and spending a summer assessing and organizing health-related apps for Apple's iTunes Store. The program is underwritten by sponsors that include Genentech, Nike, and the Mayo Clinic. Among Rock Health's San Francisco alumni are Chronology, a social network for people with Crohn's disease and colitis, and Cellscope, which builds attachments for smartphones that enable medical diagnoses to be done at home or in village clinics. 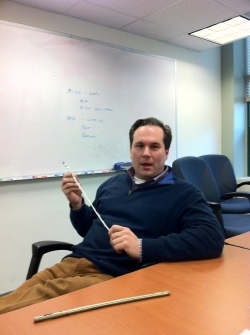 Interestingly, a Cambridge startup called Ginger.io acquired Pipette, a Rock Health alum that uses mobile phones to monitor patients' conditions, earlier in March. Application info for the Boston program is here. It's a pretty counter-intuitive concept, but what if playing video games could actually help improve conditions like depression or ADHD? A low-profile Boston start-up called Akili Interactive Labs is developing its own games to try to prove that hypothesis, and the company will conduct its first "before-and-after" brain imaging studies on players this spring. Akili is being incubated at PureTech Ventures, a Back Bay firm that seeds new life sciences start-ups, and its acting chief executive is PureTech founder Daphne Zohar. But Akili is pretty different from the typical PureTech project: the start-up has brought on board veterans of Lucas Digital Arts and Electronic Arts who have worked on games like "Star Wars: The Force Unleashed" and "Medal of Honor." "This is a whole new way of delivering therapeutic benefit in the field of cognition," says Zohar. "What if a child with ADHD symptoms, instead of taking Ritalin, could play a game?" She says the company will likely focus on attention deficit hyperactivity disorder first, with plans to study how games might affect other conditions, including stress, depression, and anxiety. Akili has been working first on games for iPhones and iPads, and testing them so far with about 50 healthy individuals, "to hone both the science and usability," Zohar says. The company is in the process of "setting up collaborations to run pilot tests in multiple patient indications with leading academic investigators," she adds. Nick Encina has come up with a pretty succinct way to describe his start-up, Wingu: "It's like 'Moneyball' for pharma," referring to the book and movie about a data-driven approach to assessing the value of baseball players. Essentially, Encina and co-founder Brian Gilman observed that even as big pharma and biotech companies were entering into more research partnerships with other entities — from start-ups to outsourced research firms — there wasn't a well-designed piece of software to collect all the data that the partnership was producing. And the "Moneyball" element is the software's ability to analyze which of the collaborations are working out the best. Today, the stealthy Cambridge start-up is planning to talk a bit more openly about what it has been developing for the past three years, with a booth at a Mass Biotech Council conference. "Pharma companies are under pressure to reduce the cost and time of developing new drugs, so they're working with all these external partners," says Encina. "What we're trying to do is create a software-as-a-service environment where you're exchanging data, tasks and timelines, and where the pharma company can tell which projects are going well." Assessing whether a partner is delivering high-quality data, and doing it on time, are among the parameters Wingu tracks, as well as how satisfied various people within the pharma company are with the performance of the partner. Over time, Encina says, "it builds up institutional knowledge about who the best partners are." Paul Gudonis seems to be engineering a miraculous recovery at Myomo, a Cambridge medical device company that seemed to be on death's doorstep in 2009, when it laid off all but four employees. The company make software and wearable robotic braces that help people who have suffered from strokes to recover the normal use of their arms. In 2004, it was the winner of MIT's high-profile business plan competition, and in 2007 it won a "best of what's new" award from Popular Science. But the company struggled to raise the money it needed to perfect the brace and win FDA approval, and like many fledgling device makers, it started off with an expensive product — $45,000 — that could only be used in a rehab clinic by specially-trained therapists. Conceptually, the device is simple. "In over 85 percent of the patients we've screened, after the damage to the brain cells from the stroke, there is still a trace of signal in the muscle when someone is trying to move their arm," says Gudonis. 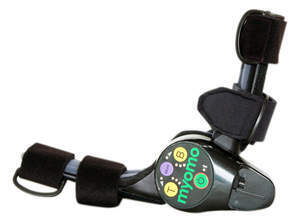 A sensor on the Myomo mPower device tunes into those signals in the bicep and tricep muscles, and "we translate it into motion with the robotics. It's kind of like having power steering for your arm." While wearing the Myomo device, patients practice typical activities like picking up a cup or opening a door. After several years of using the device for rehab, some patients have "graduated out" of using the device, as their brain has created new neuronal pathways to replace those that were damaged in the stroke, Gudonis says. I don't know about you, but my dental care regimen goes something like this: thirty seconds with the anti-plaque rinse, brushing with my Sonicare electric toothbrush, and flossing. The founders of a Lexington start-up, PhotOral, suggest adding one more step, in the morning and at night: sixty seconds chomping on a white mouthguard embedded with blue LEDs. The company is out raising $1 million to get the device ready for production, and founders Nikos Soukos and Stamatis Astra (pictured at right) invited me to their offices last week to see their just-finished working prototype. Soukos, who directs the Applied Photomolecular Research Laboratory at the Forsyth Institute in Cambridge, explained to me that nothing I do in my daily routine deals with the bacteria that live underneath my gums. "There are 800 different bacteria in your dental plaque," Soukos told me. "It's a jungle in there. Some microbes are heavily involved in the development of periodontal disease." Others may cause halitosis. Luckily, a huge percentage of those bad microbes are sensitive to light at a particular wavelength. And Soukos' lab at the Forsyth Institute — it's a non-profit Cambridge research group exclusively focused on oral health — has been studying the way light affects those microbes for a decade now. "We found that your teeth act like a mirror, delivering the light into the dental pocket," Soukos says, where it can zap those nasty bacteria. Bite down on the PhotOral device, and its blue lights turn on for sixty seconds. It beeps to let you know when the cycle is over. 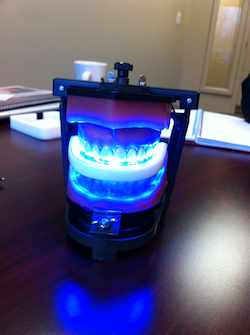 They're hoping to sell the PhotOral device directly to consumers, and through dentists, for about $60. "One scenario we'd love is that when you finish getting your teeth cleaned, the hygienist would give you one to use for sixty seconds, and explain what it is doing," says Astra, the company's chief executive. A slightly more expensive version of the device might be marketed to maintain your teeth's whiteness after a whitening treatment, he says. Astra is out in San Francisco this week, talking with investors and investment bankers. He says he hopes to have PhotOral's first product in the market in 12 to 18 months. The first million in funding will help the company conduct clinical trials to show the product is safe and effective at killing bacteria, and also to finalize the product's design. Astra estimates the company may need another $9 million or so to properly launch the device. A big question, of course, is whether consumers will be willing to add another step to their morning-and-evening oral hygiene routines — and spend $60. Are preventing gum disease and perhaps neutralizing foul breath big enough motivators to help PhotOral take a bite out of the $10 billion oral care market in the U.S.? Update: As of December 2012, the firm has ceased operations in Cambridge. Former SVP Daniel Behr explains that it "had a terrific 18-month run during which we made three biotech investments in a market hungry for early-stage investors. However, the group was dismantled in December because Access Industries (our funder) decided to fold BridgeGap’s portfolio into an Israeli biotech venture firm in which it acquired a controlling interest last June." Investors may be growing wary of the life sciences business, where companies cultivating new drugs and medical treatments can require hundreds of millions of dollars and a decade or more to get a new product across the finish line. But not Len Blavatnik, a Moscow-born industrialist who ranks at #32 on the Forbes list of the wealthiest Americans. He expects to deploy $75 million through a new Cambridge-based investment group that will scour academic labs for breakthrough research that could serve as the kernel of new companies. The new firm, Access BridgeGap Ventures, will be headed by Daniel Behr, who previously worked at the Harvard University Office of Technology Development, which helps the university spin out companies and license its research. Behr had also recently worked at Allied Minds, a Boston investment firm that hunts for promising technologies at universities and government labs. Working alongside Behr is Ben Bronstein, a long-time executive in the medical device and biotech industries. 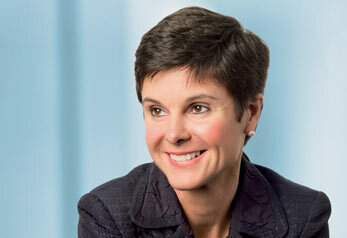 Jess Barnes will be responsible for due diligence at the new firm. Access BridgeGap is described as the "entrepreneur-run life sciences investment arm" of Blavatnik's New York-based conglomerate, which owns chemical companies, real estate, and the Warner Music Group. Behr says it will fund three to five companies per year. "Our focus is on early-stage therapeutics — treating or preventing disease — not devices or diagnostics or imaging," Behr says. The firm will consider new drugs developed in academic labs and at early-stage start-ups, as well as those developed at bigger biopharma companies that may not regard a particular disease area or approach as core to their strategy any more. Access BridgeGap may also invest in more mature companies where the early investors are tapped out, and there's an opportunity to put money in at an appealing valuation. "We're being a little contrarian by investing in early-stage therapeutics," Behr says, "but we think the likelihood of having an early exit is higher there. Behr says the firm is on the verge of making its first investment — it'll be a Boston-area start-up — but he wasn't ready to share details. Advisors to the firm include Isaac Kohlberg, the top licensing officer at Harvard's Office of Technology Development; Manuel Navia, a one-time senior executive at Vertex and Merck; and William Koster, a former head of drug discovery research at Bristol-Myers Squibb. The new company, based in Salem, NH (with software development being done in Vietnam), is also working on a health-related sensor. Vu says that Misfit is designing both hardware and software, and while he won't say exactly what the sensor will measure, he did divulge that it will be more sophisticated than a Fitbit-style exercise monitor. Vu says it's for a chronic health condition, and he expects it will have a reimbursement code so that insurers will cover its cost. Vu says the new product will ship by the end of 2012. Misfit Wearables has so far raised $750,000 from investors including Vu; Sridhar Iyengar, his co-founder at AgaMatrix; and John Sculley, the executive who replaced Steve Jobs as Apple's leader in the 1980s. I caught up Friday afternoon with Reid Leonard, the Merck executive who will head up the new $250 million Merck Research Venture Fund. While the New Jersey pharmaceutical company still hasn't made an official announcement about Leonard's new gig, word started leaking out earlier this month on Twitter. The initiative to get it established was the work of David Nicholson, who is head of worldwide licensing for the company. Several of us had been pushing the notion for a few years that, given the overall reduction in the amount of venture capital available to early-stage life sciences companies, and the increasing role of corporate venturing, it was really a good time for Merck to consider stepping up in this way. Our future pipeline depends on accessing innovation from outside. Nicholson pitched the idea late last year to Merck's CEO, Kenneth Frazier, and eventually got the green light. The fund will primarily make investments in established life sciences venture capital funds as a "limited partner," but will also be able to make direct investments in biotech companies. Managing the new fund along with Leonard are four other Merck executives from functions like licensing, finance, and corporate development. There's no plan to bring on any investment professionals from outside the company. "The decision was not to try to stand up something that looked like a completely independent venture fund," Leonard explains. "We're setting up so we can partner with the venture industry, and place some bets on the side with the direct [company] investment pool." The overall strategic intent of the fund is unabashedly that. It's strategic. It's directed toward increasing the quality and diversity of opportunities we can harvest downstream, through product partnerships or acquisitions. It's a substantial statement about our desire to help shape the landscape that we're part of, instead of just being there at the end with a catcher's mitt. Merck hopes that venture capital investors will appreciate getting access to Merck scientists, who will be available to consult with them and their companies. And for Merck, the new relationships with VC firms will "give our scientists line-of-sight into the work that's happening in these early-stage companies," Leonard says, "which may enable us to execute partnerships at an earlier stage." Leonard (who is on Twitter as @rjlflyingguy) will work out of the offices of the Merck Research Labs facility in Boston's Longwood Medical Area. He says the new fund has already made one investment in a venture capital fund, adding, "We hope to close a couple more by the end of the year." They haven't yet invested in any individual companies. Sylvie Grégoire, a long-time fixture of the New England biotech scene and president of Shire's Human Genetic Therapies business in Lexington, quietly moved to Paris over the summer. Grégoire now spends about one week a month at the company's expansive research and manufacturing campus in Lexington, which is one of the state's biggest life sciences sites, with 1250 employees. The main reason for Grégoire's move seems to have been personal: her husband, John Alam, left his job as chief medical officer at Vertex Pharmaceuticals earlier this year to run a unit of Sanofi in Paris called the "Therapeutic Strategic Area for Diseases of Aging." Cotrone says that when Grégoire isn't on-site in Lexington, Bill Ciambrone, the head of Shire's manufacturing operations there, serves as acting site head. Last month, Shire finished its latest construction project in Lexington, a lab building at 200 Shire Way. By January, the company will have moved all of its Kendall Square employees out to Lexington, Cotrone says. Shire HGT makes drugs for rare diseases, including several which compete directly with Sanofi's Genzyme division, headquartered in Cambridge. Could OvaScience's mitochondrial boost improve the success rate of older women going through IVF? The biotech start-up OvaScience was born back in January in the offices of Longwood Founders Fund, but hasn't said anything publicly about what it's up to. That'll change next week as Jonathan Tilly, a co-founder of the Boston company and chairman of its scientific advisory board, gives a talk at the annual meeting of the American Society for Reproductive Medicine, outlining the science behind OvaScience. OvaScience has high hopes that it can turn laboratory insights licensed from Harvard Medical School and Mass General into a new treatment to improve the odds of IVF, or in vitro fertilization, for couples who can't conceive naturally. It uses stem cells from the woman's body to supply a fresh batch of mitochondria that can be injected into the egg, which the company believes can improve that egg's chances of developing into a viable embyro. "Current IVF treatments don't work very well, and the main problem is egg quality," says Michelle Dipp, CEO of OvaScience and a co-founder of the Boston venture capital firm Longwood Founders Fund. The fertility treatments are only successful about 15 percent of the time when women are over age 40, Dipp says, and 45 percent of the time when women are under age 40. Dipp says about 3.2 million people in the U.S. seek treatment for infertility each year, but only about 60,000 go through the IVF process — partly because of the high failure rate, and partly because of the cost. As a woman's eggs age, they have fewer functioning mitochondria inside; mitochondria, you'll remember from your high school biology, produce the ATP that cells use as their energy supply. OvaScience plans to replenish the mitochondria. First, in a laparoscopic procedure, the company will remove a small amount of ovarian tissue from the IVF patient. Then, the company will isolate the ovarian stem cells and extract the mitochondria from them. "Healthy eggs have anywhere from 100,000 to one million functioning mitochondria," says Scott Chappel, chief scientific office of OvaScience, and a veteran of Serono and Dyax. "We will inject 100,000 mitochondria into the egg at the same time as the sperm is injected," in a procedure known as ICSI (intracytoplasmic sperm injection), which is already commonplace in the IVF world. OvaScience's hope is that its treatment will persuade doctors and patients to implant fewer embryos during an IVF "cycle" — resulting in fewer multiple births — by improving the success rate. The company has about 10 employees, who are mainly overseeing the design of a clinical trial. It'll include about 40 patients at two fertility clinics in the Boston area. (The company wasn't willing to name the clinics yet.) "Our target population are women who have already failed at least two IVF attempts, and the explanation is poor oocyte quality," says Chappel. Dipp notes that while OvaScience will have to comply with established practices for handling tissues and cells, OvaScience's treatment will not have to go through the same approval process as do new drugs or devices. OvaScience's co-founders are Tilly, Dipp, Christoph Westphal, Rich Aldrich, and David Sinclair of Harvard. Sinclair, Dipp, Aldrich, and Westphal all worked together earlier at Sirtris Pharmaceuticals, which went public before being acquired by GlaxoSmithKline. 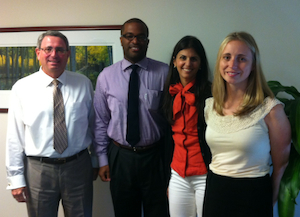 OvaScience's initial financial backing of $6 million comes from Longwood Founders Fund and Bessemer Venture Partners. Boston-based Karuna Pharmaceuticals is set to announce this week that it has licensed a set of scientific discoveries from Vanderbilt University's Center for Neuroscience Discovery. The start-up hopes to develop them into effective new drugs for schizophrenia, a disabling mental illness that affects more than 24 million people worldwide. A problem with existing drugs for schizophrenia, explains Karuna chief executive Ed Harrigan, is that they only treat some of the symptoms of the disease. "Current drugs do a reasonable job with hallucinations and delusions. But they don't address some of the impairments of attention and memory, or the asociality and anhedonia that can accompany the disease. And those are all symptoms that can really block people from being reintegrated into society." The family of chemical compounds that Karuna has licensed from Vanderbilt are called glycine transport inhibitors. Harrigan believes that they may be useful in addressing neurological signaling problems in the brains of schizophrenics. The hypothesis, he explains, is that there may be insufficient levels of the neurotransmitter glutamate in the synapses, or spaces between neurons, of people suffering from schizophrenia. Increasing the amount of glycine — another neurotransmitter — may dial up the effectiveness of the glutamate that is present. Karuna is also developing another treatment for schizophrenia, based on a drug that is no longer patented. (The company has made modifications and applied for a new patent.) Harrigan, formerly a senior licensing executive at Pfizer, says both programs "have the potential to be a breakthrough treatment." The off-patent drug has already been through clinical trials, and Karuna may soon begin trials of its own. The compounds licensed from Vanderbilt have not yet been tested in humans. Karuna is set up as a "virtual" pharma company, with a handful of employees working with a network of outside service providers to shepherd along promising chemical compounds, perhaps to the point where they'll be acquired or licensed by larger entities. (Virtual pharmas typically don't have their own labs, or plans to set up manufacturing facilities.) 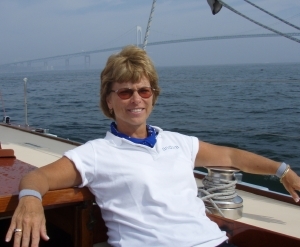 Harrigan works in Waterford, Connecticut, and the company has office space that it shares with Puretech Ventures, the Boston venture firm that helped form Karuna. The company, formed in January, has received about $1.5 million in seed funding so far, and Harrigan says it may soon raise more: "We're talking to a number of potential funding sources." I'd been hearing buzz lately that Atlas Venture, newly ensconced in East Cambridge, had been inviting an increasing number of entrepreneurs to cultivate new companies in their offices, with the goal of making small seed investments if their ideas started to click. "We're doing much more seed these days than we did in the past decade," Atlas partner Jean-Francois Formela told me last week. Today, one of the start-ups that has been percolating in the Atlas offices, Nimbus Discovery, is announcing that Bill Gates is putting some money in, joining a seed round that began last year with $3.5 million from Atlas and Schrödinger, a New York company that sells software that scientists use to design drugs. Also keeping the crew at Atlas busy is a new project called Atlas Venture Development Corp. Led by David Grayzel, formerly an executive at Infinity Pharmaceuticals, it's a way for Atlas to "adopt" certain products that may have been set aside by companies — perhaps because they don't seem to be making enough progress, or because of a corporate shift in strategy — and develop them using a network of contractors. Formela likens the approach to "cloud computing" in that Atlas won't necessarily set up wet labs and hire scientists to move the products forward, but will outsource almost everything. "We're seeing that most of the pharmaceutical pipeline is valued at zero," Formela says. "Pharma companies are valued almost entirely on their cash flows, so they have to trim down the resources they put into early-stage development." AVDC, he says, will try to bring speed and nimbleness to developing individual drugs, and "apply the venture model." AVDC got its start last June. Grayzel's job will be to "look at a bunch of molecules, pick the ones we think we can add value to, and bring a virtual team together around them, using [contract research organizations] and other vendors, and sometimes even using the pharmaceutical company as a service entity, paying the cost," Formela says. "We're looking all over for assets," Grayzel says. "Half probably is within big pharma, and some from large and mid-cap biotech, and some from small biotech and academia. We're agnostic as to the therapeutic area, and it could be a biologic or a small molecule drug." If a drug under development shows promise in clinical trials, it might be "re-adopted" by the original owner (with Atlas getting a piece of the upside), or perhaps be licensed to another company, with Atlas and the original owner getting a share of royalties or a check from an outright purchase. Atlas says it will invest about $15 million in AVDC (some of the money may be supplied by other investors), with a goal of working on 8 to 12 new products. Grayzel says they hope to have the first AVDC product in development later this spring. Well, that was a swell three-decade run. Genzyme was one of those classic Massachusetts success stories — a company obsessed with figuring out how to do the impossible. The company's very first product treated a rare and previously untreatable malady called Gaucher's disease. Genzyme developed its first treatment by extracting and purifying an enzyme out of human placentas (yikes: it required 22,000 placentas to treat a single patient for one year), and later it pioneered a method of making a synthetic form of the enzyme using genetically engineered animal cells. In the years since, Genzyme has developed and acquired other products to treat rare diseases like Gaucher's, as well as kidney disease and arthritis. It has poured tens of millions into cultivating new drugs for cystic fibrosis and multiple sclerosis, too. 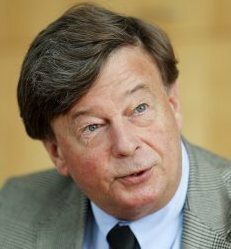 This morning, I was remembering when I first interviewed Genzyme CEO Henri Termeer, back in 2003. Sitting in the company's brand-new Kendall Square high-rise, he recalled how in the late 1970s and early 1980s, biotechnology was seen as a field of enormous promise, but companies were applying it in all sorts of ways that turned out to be economically unsustainable: developing perm treatments, dying fabric, unclogging drains. "People just had no idea how these technologies could be best leveraged," Termeer said. When he joined Genzyme, in 1983, the company had fewer than a dozen employees. A research collaboration with the National Institutes of Health led to the company's first product, even after a first clinical trial showed poor results. Genzyme and other Boston biotech companies, like Biogen and Genetics Institute, grew here, Termeer told me, because of the presence of top-notch universities and venture capitalists with money to invest. One thing that wasn't here: big pharma companies. Their absence allowed Genzyme and others to hire the best scientists and product development people, and point them at audacious goals. 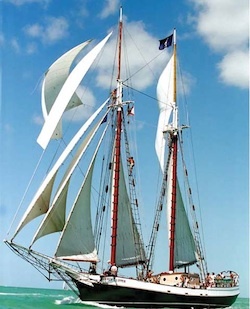 "It was a magnificently pioneering time," Termeer said. The biggest pharmaceutical companies were focused on making "enormous money with small, incremental improvements on their products," and then hawking those improvements with their "enormous marketing power." That created a vacuum in which Genzyme and a handful of other big biotechs grew. It's interesting to wonder whether Genzyme would still be trucking along as an independent company if Termeer had groomed an obvious successor to lead the company once he retires...or if the company hadn't encountered a lengthy series of manufacturing problems that began in 2009. Can Genzyme be anywhere near as innovative a company inside the corporate hull of Sanofi as it has been on its own? Will Termeer stick around in any kind of substantive way? Betting on either scenario is like betting that the sequel to a movie you loved will be better than the original. I'm not excited, you may be able tell, about the prospect of another branch office in Kendall Square. But I'm also not pessimistic about the likelihood that we will create other Genzymes here... as long as there are small teams of researchers in grubby office space who believe they see some glimmer of promise on the horizon, and leaders like Termeer to point them in the right direction. A dozen years after it was founded, the MIT spin-out MicroCHIPS has finally started testing its implantable drug delivery system in humans. MicroCHIPS CEO Ajit Gill tells me the company began the study last month in Denmark, implanting its small, subcutaneous device in eight women suffering from osteoporosis. The MicroCHIPS device, pictured at right, will be delivering a drug called Forteo, made by Eli Lilly & Co. and used to increase bone density in patients suffering from severe osteoporosis. Currently, women who take the drug need to give themselves daily injections. Eventually, MicroCHIPS aims to market a device that could deliver the drug for about a year — no needle pokes required. (Most patients on Forteo, a synthetic version of parathyroid hormone, take it for about two years, Gill says.) 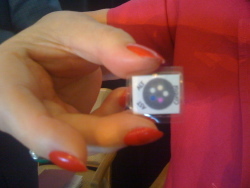 The implant can be done in a doctor's office with just local anesthetic, says Gill, who joined MicroCHIPS last spring. 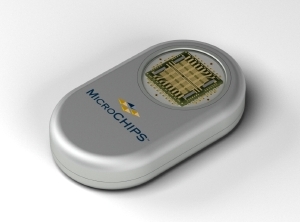 The MicroCHIPS device holds tiny doses of a drug inside reservoirs that can pop open on a pre-programmed schedule, or as a doctor deems necessary, triggering releases with a handheld wireless device. (A small pulse of electricity melts a layer of titanium and platinum that seals the top of each reservoir.) This first study in humans will look at how the osteoporosis drug circulates in patients' bodies once it is released. MicroCHIPS sprang from MIT research done by professors Bob Langer, Michael Cima, and a PhD student of theirs, John Santini, who served as the company's CEO until last year. Early last year, Santini told me that the company had raised more than $70 million to develop its implant, much of it from Polaris Venture Partners in Waltham, Flybridge Capital Partners in Boston, and corporate investors like Medtronic and Novartis. Why did it take the company so long to get its device into humans? Gill says that keeping moisture out of the device proved a big headache: "Proteins and peptides are really sensitive to moisture, and hermetically sealing it turned out to be challenging." MIT professor Langer says that a lot of money was spent exploring whether the device should be used to dispense drugs, or hold an array of sensors that could be exposed to the body over time to detect things like blood sugar level. "Money and time were split between those two ideas," he says. More issues the start-up faced: "Accurately loading and dosing the drug [onto the chip], and formulation and drug stability," Langer says. "It's a totally new kind of technology, and that's both good and bad." The device that MicroCHIPS is currently testing has just 20 reservoirs that hold individual doses of a drug, but Gill says the product that the company plans to market will have 400 reservoirs. "Our next step will be developing that commercial device and putting it through tests," he says. Gill says the company has also been exploring using its technology to deliver various multiple sclerosis drugs, and glucagon, a drug used to raise blood sugar levels in diabetics. And Gill adds that the company will likely need to raise even more money to win FDA approval for its device. Some of that money, he suggests, could come from corporate partners. LifeImage has wrapped up its second round of funding at $12 million, bringing the total the three-year-old company has raised to $17 million. It's nice to see a company focused on something that's an actual problem in the actual world in which we live: trying to slash the number of unnecessary X-rays, CT scans, and MRI tests done in the U.S. each year. From the patient's perspective, it means being jammed into a narrow tube less often — and being exposed to less radiation. And from an overall healthcare system perspective, our country spends about $30 billion on pointless medical imaging, according to LifeImage founder and CEO Hamid Tabatabaie. The business model is to eventually charge $1 per exam to make the image available to anyone who needs it, Tabatabaie explains. "There are about a billion imaging exams done each year, so that's a billion-dollar business for us" — though he believes the company will save the healthcare system far more. The company, Tabatabaie's fourth start-up, has 42 employees. 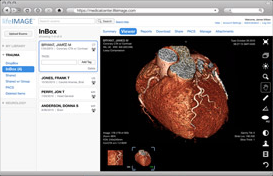 Already, around Boston, hospitals like MassGeneral, the Lahey Clinic, Tufts Medical Center, and Children's Hospital Boston are using LifeImage's software. Leading the company's latest round of funding are Cardinal Partners of New Jersey and Galen Partners, in Stamford, Connecticut. Genocea Biosciences Inc. is announcing today that it has attracted an additional $35 million in funding, some of it from the venture capital arm of Johnson & Johnson. Genocea, with just 34 employees, has now raised more than $60 million. The Cambridge start-up has a new approach to developing vaccines that it says is faster and less expensive than established methods, especially for stealthy bacteria that have been difficult for traditional vaccines to target. Genocea says its vaccines seek to employ T cells, a kind of white blood cell ordinarily found in the body, to trigger a powerful immune response. But identifying the right T cell antigens to use in a vaccine has typically been a haphazard process that Genocea says it can make more methodical. Chip Clark, the company’s chief business officer says, “Our technology allows us to go from the blackboard to proof-of-concept in animals to vaccines that work in humans very quickly." Clark says the new funding will be used, in part, to shepherd a vaccine for herpes simplex-2 through clinical trials. (About 15 percent of people in the U.S. suffer from herpes simplex-2.) Genocea is also developing vaccines for malaria and streptococcus pneumoniae, which is the leading killer of children under the age of five worldwide. 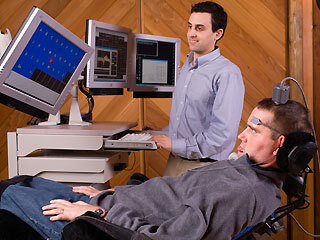 Genocea’s scientific founders are both Harvard professors: Darren Higgins and David Sinclair. The company recently hired Seth Hetherington, formerly at the North Carolina biotech Icagen Inc., as its chief medical officer. The company is in the final stages of recruiting a chief executive to replace Robert Paull, the venture capitalist who served as its initial CEO. Clark says the company won't be doing "exorbitant hiring," but will use the new money to bring on some additional regulatory and clinical affairs employees. Joining Johnson & Johnson in this latest round are Skyline Ventures and MP Healthcare Venture Management. The company has also attracted about $6 million in grants from the Gates Foundation and the Department of Defense. NinePoint Medical, a Cambridge start-up that is working on new imaging technology for gastrointestinal procedures, is announcing today the largest licensing agreement that Mass General has ever done in the medical device arena. NinePoint is licensing 188 patents and patent applications from Mass General, but financial terms aren't being disclosed. Earlier this year, the company raised $33 million in first round funding from Boston's Third Rock Ventures and Prospect Venture Partners, based in California. CEO Charles Carignan says the company is developing a device that will use infrared laser light to create a three-dimensional image of the esophagus, including areas beneath the surface that may be potentially cancerous. "Think about looking through a camera at a building," Carignan says. "You can see the wall, but you can't see inside. With our technology, you'll be able to see inside the building, past the wall." Eventually, the company plans to be able to transmit its imagery in real-time to an off-site pathologist, who might recommend that the gastroenterologist perform a biopsy, or even immediately diagnose a condition like reflux disease or Barrett's esophagus, and proceed directly to treatment. "We're planning to start with the upper gastrointenstinal tract, and then move to the pancreas, the duodenum, and the stomach," Carignan says. He joined the company as CEO in January; the license agreement with Mass General, where a prototype device was developed at the Wellman Center for Photomedicine, took the bulk of the year. Working alongside Carignan at NinePoint are Mike Madden, head of R&D, who came from Boston Scientific; Jim Moriarty, head of program management, previously at Medtronic; and Jessica Duda, senior director of business development, formerly of CyberKinetics. NinePoint has a dozen employees in Cambridge, though Carignan expects the company's headcount to hit 40 by next year. NinePoint is preparing to move into a new 17,000-square foot office in Kendall Square. Investors are handing an additional $18 million to Semprus BioSciences of Cambridge, one of the biggest medical device investments of the year locally. 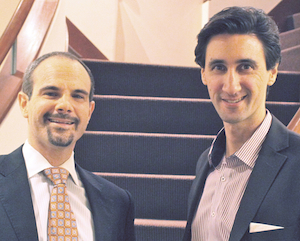 Semprus is developing a process that it says can make implantable devices more resistant to bacterial infection over a long period of time; such infections cause more than 50,000 deaths a year, says Semprus chief executive David Lucchino (at right). The new funding round is being led by SR One, the corporate venture capital fund of GlaxoSmithKline, and Connecticut-based Foundation Medical Partners. Semprus has now raised $28.5 million in total. Semprus' technology has its roots in the Langer Lab at MIT; Lucchino says he first learned of it while earning his MBA at MIT, when professor Bob Langer introduced him to one of the PhD students working in the lab, Chris Loose. Loose now serves as Semprus' chief technology officer. Semprus says it can add a specially-bonded layer to medical devices like catheters used for kidney dialysis and bone implants that can prevent clotting and fend off bacteria and fungus. "It's not a coating, but a physical extension of the device itself," Lucchino explains, "which means it lasts much longer than any coating could." Lucchino says the company has already collected data showing that its process reduces clotting and bacteria adhesion for at least three months. The surface Semprus adds could also be used for delivering drugs, or agents that promote bone or tissue growth, Lucchino says. The company has 27 employees, and Lucchino says he's currently hiring quality assurance engineers. His plan is that the new round of financing will be sufficient to carry Semprus through FDA approval. In its formative stages, the company won business plan competitions at MIT, Oxford University, and Harvard Business School. "People used to tease us and say that our business model was to win business plan competitions," says Lucchino, adding that the company raked in almost $100,000 that way. Just a quick update on Cambridge-based InVivo Therapeutics, which is developing implant technology it hopes will restore function in people who've suffered serious spinal cord injuries. I wrote about the company late last month, when CEO Frank Reynolds told me the company was hoping to begin clinical trials of its first product this year, and win FDA approval next year. Reynolds predicted that the company's first product would generate a billion or two in revenues for the start-up. Reynolds also told me InVivo planned to gain a public market listing through a reverse merger — a transaction that involves taking over the listing of a defunct company. Earlier this month, InVivo began the process of merging with a Chapel Hill, North Carolina company called Design Source. (The company used to market and sell fabric and draperies to interior designers.) That'll get InVivo a listing on the OTC Bulletin Board, home of lightly-traded stocks sometimes called "penny stocks." This afternoon, Reynolds will be part of a board meeting held by the Massachusetts Life Sciences Center, to make "an important announcement about his company," according to a press alert I received yesterday. Last year, InVivo received a $500,000 loan from the publicly-funded agency. Spokesman Angus McQuilken wouldn't comment yesterday about the nature of Reynolds' announcement, but he did note that if InVivo has raised at least $5 million in funding, the terms of the loan compel the company to repay it. Reynolds didn't return a call placed yesterday to comment on either issue. An InVivo spokesman today said Reynolds would likely take the Wharton case to an appellate court. Late last week, I started receiving e-mails and calls from biotech executives and venture capitalists. They all wanted to talk with me about a woman named Anne Baia. I'd never met Baia, but she sounds like the kind of person whom you no doubt have encountered at some point in your work life: the person who's intimately involved in laying the foundation for success and almost single-handedly responsible for keeping all kinds of crises at bay — but who operates entirely behind the scenes. The person never quoted in a press release, or invited to keynote at an industry conference. Baia was one of those people with start-ups in her DNA: someone who devoted her career to helping transform scientific research into actual products that could help people. Most recently, Baia had been head of finance at Cambridge-based Visterra, a start-up developing new vaccines for seasonal and pandemic flu. She was also a co-founder at Avaxia Biologics, a Wayland company working on drugs that might help control the side effects of radiation and chemotherapy treatment in cancer patients. 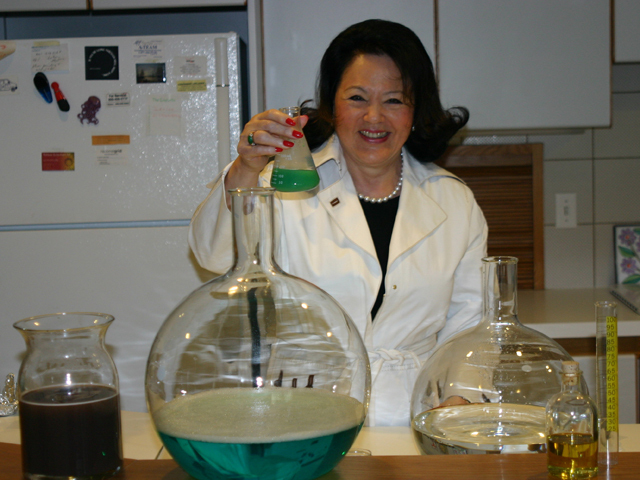 Over her career, Baia was a sort of "free agent" finance and operations executive who helped launch many other local biotech start-ups. She died last Wednesday of lung cancer, at age 54. Today's Globe column focuses on InVivo Therapeutics, a Cambridge start-up developing an implantable device they hope will help spinal injury victims do better at recovering function after an accident. The technology is licensed from MIT and Childrens Hospital Boston, and the company hopes to go public soon through a reverse-merger transaction. - Worth reading is this Inc. Magazine article from March of this year, "What Makes Frank Run." - Here's the lawsuit Reynolds filed in 1994, two years after he had spinal fusion surgery at Pennsylvania Hospital (on December 14, 1992). It does not mention a car accident or subsequent paralysis. Reynolds eventually won a $750,000 judgment against one of the orthopedic surgeons who performed the surgery. Frank Reynolds...was injured while loading a truck on the job in December 1991. Before undergoing surgery that involved a spinal fusion with pedicle screws at Pennsylvania Hospital in December 1992, Reynolds said he was told by his surgeon that ''you'll be back at work in six weeks. . . . He said I will play tennis, basketball and golf at full speed." - Asked about that article and the 1994 lawsuit, Reynolds replied in an e-mail, "The facts you sent me are wrong," and by phone told me that he was working as a psychotherapist at the time of his car accident. - InVivo filed suit against an Oregon research lab last year that was conducting primate research for the company; that suit has since been settled. Reynolds is still in the midst of a legal tussle with the University of Pennsylvania over a Master's program he attended there. At issue is whether participants in the Executive Master's in Technology Management program, co-sponsored by Penn's engineering school and Wharton School of business, ought to be considered graduates of the Wharton School. Reynolds has won two jury verdicts. "That's got to be over," Reynolds says, but an attorney for the university tells me his client plans to appeal. One of the fastest-growing clusters of companies in Boston right now are diagnostics start-ups: companies like SynapDx, which is working to develop tests for the early detection of autism; T2 Biosystems, trying to pack sophisticated lab tests into portable devices; and Diagnostics for All, a Harvard spin-out that is creating cheap, paper-based tests for use in the developing world. In the photo, Diagnostics for All chief executive Una Ryan is holding a postage-stamp sized test that changes color, after a drop of blood has been applied to it, to indicate how well a patient's liver is functioning. That's essential information if the patient is taking drugs to treat HIV/AIDS or tuberculosis. Surprising news in this SEC filing today: Waltham's Polaris Venture Partners, one of the more active local firms investing in tech, cleantech, and life sciences, is planning to raise $400 million for its next fund. That's less than half the value of the $1 billion fund Polaris raised in 2006. "Limited partners [who put money into VC funds] are a little bit weary of life sciences venture capital, and somewhat skeptical...There is probably going to be even less capital that's available for early-stage life sciences investing." "It's going to be a challenging decade. Will there be capital around for life sciences investing? Yes there will, but there will be fewer groups doing it." McGuire, until recently the chairman of the National Venture Capital Association, predicted a sharp decline in membership of that group. 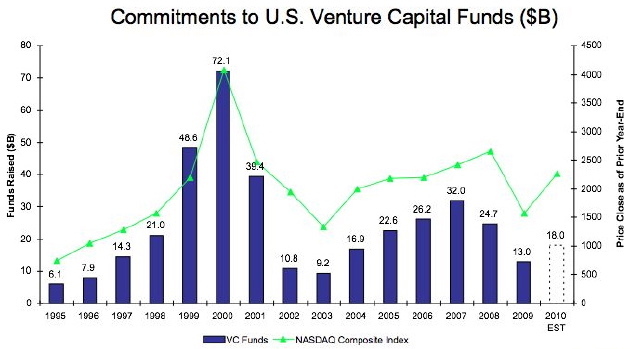 He also said he thought the expectation that venture capitalists would raise $18 billion in new funds this year (see chart below, from the law firm WilmerHale) was overly bullish. McGuire said, "Historically the biotech world has depended on the public markets to be there," and if there is no appetite for life sciences IPOs, that will result in a lack of capital to keep moving new drugs toward FDA approval. Gadicke, who at MPM is also out in the market raising a new fund, estimated that there are about 20 to 25 "interesting" (read: non-fire-sale) M&A transactions each year in life sciences, and joked that MPM and Polaris both hope those transactions will only involve their portfolio companies. McGuire also talked about "capital efficient" start-ups, which is a concept you hear about more often in tech than biotech, where companies routinely require $50 million or more in funding to cultivate new drugs to the point where they're interesting to bigger partners in the pharma industry. Despite the depressing predictions, McGuire several times said he is an optimist by nature. He also said, "Darwin was an optimist — good things come out of severe moments." I know my presence at a conference always adds a lot, but I was still a bit surprised to be handed $300,000 upon arriving at the Westin Copley for this week's Massachusetts Life Sciences Innovation Day. The third annual event was organized by the Massachusetts Technology Transfer Center, the Mass Biotech Council, and Anupendra Sharma, an investor at the Boston office of Siemens Ventures. 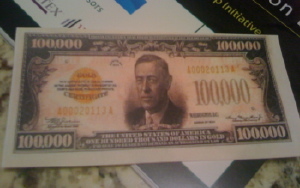 Even more surprising was that the faux currency featured the picture of Woodrow Wilson — was he the biotech President? The cash could be "invested" in any of the research projects or early-stage start-up companies that were arrayed in the conference's lobby, which ranged from new tools for installing screws endoscopically to low-cost ventilators to electronic ink for medical applications. The three technologies that attracted the most backing from participants received cash prizes, with the winner getting $1000. In first place was Diagnostics for All, a new non-profit spawned from George Whitesides' lab at Harvard that is developing paper-based diagnostics. The runner-up was Hybergenica, another start-up with Harvard roots; they're working on a liquid solution called Somah that can slow down the deterioration process of organs awaiting transplantation. Lots of rumors circulating this week about who Cambridge-based Biogen Idec may be considering as the publicly-traded biotech company's search for its next CEO passes the four-month mark. Given that current Biogen CEO Jim Mullen is resigning under pressure from activist investor Carl Icahn, the big question about the CEO search, being managed by the recruiting firm Spencer Stuart, is whether the next CEO's mandate will be to sell Biogen whole-hog or in pieces, or to rebuild it. "The profile of the CEO you'd hire in those two situations is very different," says one Biogen alum now working at another Cambridge biotech. "If it were me, I'd be opting for the re-build. They have tremendous talent in R&D. But that group has always been a bit of a stepchild, as the company has reeled from one crisis to the next." 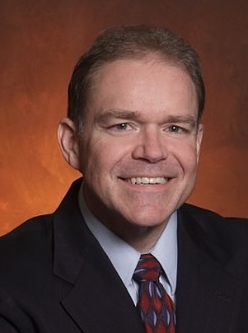 The company hasn't had a top research executive since Cecil Pickett resigned last year. This executive thinks the odds are slim that Spencer Stuart and the board will pick an internal candidate. But Dunsire would be an interesting choice: an MD who has run a public company, and could be tiring of reporting to far-off bosses, though Millennium does operate with a decent degree of autonomy. "She's just waiting to be plucked out of Takeda," says Alison Taunton-Rigby, a Biogen alum who is now CEO of RiboNovix. One local biotech recruiter mentioned the possibility of coaxing former Genentech CEO Art Levinson out of retirement; that'd be a long shot. This recruiter, who isn't involved in the search, said her money was riding on Biogen's next CEO being an executive plucked from the pharmaceutical industry. "With all of the M&A going on in pharma, there's a pool of talent that's available," observes Vicki Sato, the former Vertex president (and a onetime Biogen research VP) who is now an advisor to Atlas Venture and a professor at Harvard Business School. "Since Biogen is an operating company with drugs on the market, as opposed to an early-stage company still developing its first drugs, the pharma experience would be relevant," Sato says. When are we likely to find out the results of the search? Biogen Idec spokeswoman Amy Reilly would only say that "the CEO search is the board's top priority in the near-term. The process is well underway, and the board is confident that it will attract an exceptional individual." Are they considering both internal and external candidates? "We haven't commented on that, but the search committee has been actively interviewing highly-qualified candidates." Though he isn't mentioned on the start-up's sparse Web site, Prism VentureWorks co-founder John Brooks tells me that he recently took the reins at Reflectence Medical, a Marlborough-based company developing a non-invasive monitoring device for critically ill patients. 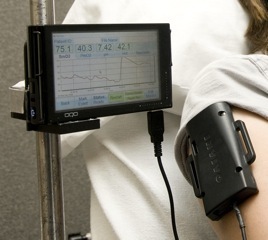 The company's technology is a iPhone-sized sensor that can be affixed to the skin on the upper arm, and connected to a monitor. "It measures how much light is going through the skin, and how much is reflected back by the microcirculatory system," Brooks explains. "It lets you determine if the muscles and tissues and the microcirculatory system are using oxygen," as well as the levels of pH and hematocrit in the blood. Brooks says the technology isn't intended to replace pulse oximetry (those devices that clip onto your fingertip and measure the oxygen saturation in your blood), but to complement it. "In our case, we're determining whether the oxygen is being used in the microcapillary system, which gives you the ability to determine early that there may be internal bleeding." One reason for the military's interest in the technology, Brooks says, is that it can provide better information about the true status of a wounded soldier. Early detection can help prevent a soldier from going into shock, for instance, when he is being transported from the battlefield to a medical center. Fundraising is "part of my objective," says Brooks, who in addition to his work as an investor at Prism also served as a co-founder of three companies, including Bedford-based Insulet Corp., now publicly-traded. "For the last 18 months, the VC environment has been tough, and patient monitoring is an area that's a little bit off their radar screen." Some additional funding could come from the military, and Reflectence applied for a $500,000 matching grant from the Massachusetts Life Sciences Center, but hasn't yet heard back. Timing can be a funny thing for entrepreneurs hoping to snare a VC's interest, Brooks has learned. "Some investors want to go really early, and some want the company to have gotten through the FDA regulatory process before they invest." Reflectence falls somewhere in the middle. And there's always the question of "how you give investors comfort that the uptake and utilization of a new technology is going to happen," he says. Brooks says he hasn't given up on raising VC money, but he's trying to develop a strategy that could help the company win regulatory approval in Europe or the U.S. without it. With a first FDA submission this fall or winter, "then we can start providing evaluation units to the military, and the hope is that at that stage, we'll become more attractive to venture investors and strategic investors," Brooks says. Brooks says the CEO role at Reflectence isn't a full-time thing right now; he is also active with MassMedic's MedTech IGNITE mentoring program and is a senior advisor to Johnston Blakely & Co., a Boston-based investment bank. 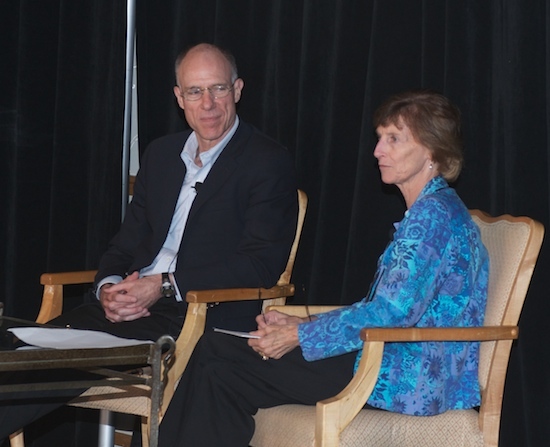 Lots of fun lunching today with Nobel laureates Philip Sharp and Sir Richard Roberts, and conducting an on-stage interview with the two immediately afterward at the Massachusetts Biotechnology Council's annual meeting. The two were awarded Nobel Prizes in 1993, for work they did independently on RNA splicing. When I asked Sir Richard at lunch what we could do to spark more interest in science among young people, I was surprised by his answer: make it easier for them get their hands on fireworks. That, apparently, is what initially got Sir Richard jazzed about chemistry. "When I talk to my Nobel colleagues," he said during the on-stage portion of our conversation, "more than half of them got interested in science via fireworks." Blowing stuff up, apparently, generates excitement about chemistry in a way that staring at the periodic table of the elements just doesn't. 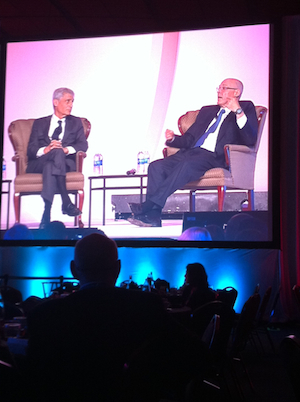 I also asked Sir Richard and Sharp where they feel the biggest opportunities are today. Sir Richard, chief scientific officer at New England Biolabs, mentioned stem cells ("this has to be the future of medicine," he said) and the study of bacteria.The human meta-genome — all of the bacteria and other organisms that live with us — is more interesting than the genome, Sir Richard said, suggesting that the National Institutes of Health ought to spend more money researching bacteria, some of which are known to cause cancer. Of designing treatments for individuals based on their particular genetic make-up, Sharp said, "it's coming, but [personalized medicine] will be accused of overhype for the next ten years." One thing Boston and Silicon Valley have in common: it's very hard to see the places where innovation actually happens. The interesting work takes place in labs behind locked doors and in conference rooms that require clearance to enter. Want to dine at Google's cafeteria in Mountain View, or walk the halls at BBN in Cambridge where some of the researchers who helped build the Internet and develop e-mail still toil? You'll need a special invitation. So when a visitor asks you how they might see what's interesting and vibrant about the tech scene in either place, the answer isn't easy. That's why I wanted to put together a short tour of Boston places where you can actually get a sense for what has made the city's innovation economy tick, over more than two centuries. I asked some friends on Twitter for help — and got it. 2. I wanted to focus on locations in the city so you can do the tour without a car — either by using the T, a bike, or even on foot. The tour exists as an annotated Google Map, and I've listed the stops below as text. 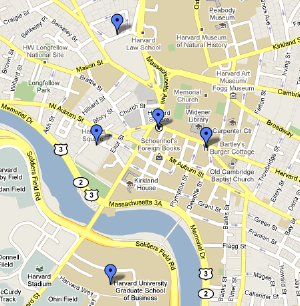 Are there nearby locations that are worth a look? Add a comment if you would. Investors are handing another $16.5 million to MicroCHIPS, the Bedford-based start-up that has spent over a decade developing a new kind of implantable medical device capable of delivering drugs inside the body or sensing changing disease states. InterWest Partners is a new participant in this round, joining local firms Polaris Venture Partners, Flybridge Capital Partners, and corporate investors like Novartis and Medtronic. This round, designated as the C round, brings the company's total funding to "just over $70 million," according to founder and CEO John Santini. It closed in October, Santini says, but the company is just announcing it today. "What can I say? We've been busy," he quips. Since the company spun out of an MIT lab in 1999, MicroCHIPS has been chasing a futuristic vision: use implanted chips to dispense drugs over time, or expose sensors to the body's chemistry -- and allow doctors or patients to monitor and control the chips wirelessly. The new funding will help support clinical trials -- the company's first in human patients -- in diabetes and osteoporosis. I spoke with Santini earlier this week about the funding and the company's 2010 plans. The high-profile Cambridge non-profit Diagnostics for All is getting its first chief executive: Una Ryan, formerly head of the vaccine-maker Avant ImmunoTherapeutics and one-time chair of the Mass Biotech Council. Diagnostics for All is developing very cheap health tests for the developing world, which would be printed on paper and thus disposable. The technology originated in the Harvard lab of George Whitesides, and the blueprint for the non-profit organization took first place in the MIT $100K Entrepreneurship Competition last year. Tests for diagnosing health problems like liver failure would require just a drop of blood to be applied to the paper, which changes color to indicate the result -- no lab work necessary. The paper can then be burned, avoiding contamination issues. The organization's early work has been funded by the Bill and Melinda Gates Foundation, and eventually Diagnostics for All hopes to branch out into tests for tuberculosis, malaria, AIDS, and diabetes. Asked about her objectives in the new job, which she will start next month, Ryan explains in an e-mail, "We plan to design paper diagnostics the size of a postage stamp that require no pumps, power or palaver. ...Initial proof-of-concept will be liver function tests for those on anti-retrovirals or diabetes drugs that have these side effects. We will then move to 'fever of unknown origin.' My personal goal is to take this concept of 'simple and inexpensive' beyond diagnostics to revolutionize the way we think about health care." Ryan tells me that she's also planning to start a for-profit arm of Diagnostics for All. Amy Frederick wrote in yesterday to make sure I knew about a mentoring program she runs within MassMedic called MedTech Ignite, which aims to create high-powered mentoring opportunities for device start-ups. For the past year, since I have been director of the program, we have been running a series of office hour programs. Here, the goal is to provide the start-up company with one-on-one feedback for a specific topic after a general overview for the given program. Past office hours have included IP office hours, regulatory office hours, [and] next week the Ignite program will be hosting a Corporations 101 office hours. For more information on this program please go to: www.massmedic.com. But the technology, which was quickly licensed to a start-up called CyberKinetics Neurotechnology Systems, always seemed to Stibel like more of a long-term research project. "It just felt too early to me to try to commercialize it," he says. Stibel was right. He left Brown to start Simpli.com, a service that analyzed user behavior on the Internet -- and which was acquired by NetZero in 2000 for about $23 million. CyberKinetics raised more than $40 million, went public through a reverse-merger, acquired another small med-tech company, but was unable to keep funding its activities. Though its early human implants were celebrated by Wired Magazine, it never got a product approved by the FDA and into the market. 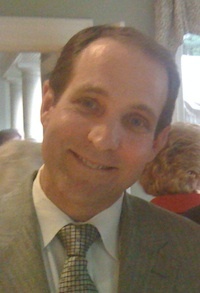 In late 2008 and early 2009, CEO Tim Surgenor sold off all its assets. One of the buyers was Jeff Stibel, now president of the publicly-traded Internet marketing company Web.com. He's planning to invest millions of his own money to start The BrainGate Company, which will be based in Boston and Los Angeles. I spoke with Stibel yesterday to find out about his plans, in advance of the launch of the new company's official Web site, which happens later this week. This week's Innovation Economy column focuses on Advanced Image Enhancement, a tiny Rhode Island company that has partnered with Hologic to bring some new software to market. The software, originally developed to assist the U.S. Navy in finding mines hidden underwater, aims to help radiologists diagnose breast cancer. Here's a video report on the software and its origins. The caveat: it was produced by the Pentagon -- so expect a hefty dose of rah-rah.